A dream that mothers will feel confident to choose physiological, intuitive childbirth; that babies will be born in a safer way, without medication in their systems, easily able to breathe, nurse and search their parent’s eyes with wonder and love; and that babies will never endure hours of fright and stress hearing their mothers suffer in childbirth before they slide out into our world. Our Hypnobabies program has become so successful at creating joyful natural births that childbirth educators, doulas and our own experienced Hypno-moms are registering to become Hypnobabies Instructors so that they can bring Hypnobabies to their own communities. Read/watch what our wonderful Hypnobabies Instructors have to say about becoming trained and certified by Hypnobabies, and teaching classes to pregnant moms/couples so they can have *much* easier births! If you share our passion and love for working with expectant couples, and want to provide them with an excellent and very effective childbirth hypnosis program, please read the information below and on the other Instructor training pages on this site. Unlike any other childbirth hypnosis programs, Hypnobabies is a complete preparation for childbirth education course, and cannot be taught along with another childbirth or hypnobirthing program, used to “supplement” one, or “added to” hypnotherapy sessions. Hypnobabies is always taught in 6, 3-hour classes using our extremely comprehensive Hypnobabies materials. The results are amazing! Bring easier, more comfortable childbirth to your community by joining us at Hypnobabies Instructor Training! Our Hypnobabies Instructor Training is an in-person training; extremely detailed and comprehensive, very hands-on with hypnosis demonstrations and participation as well as a full Hypnobabies birth rehearsal. 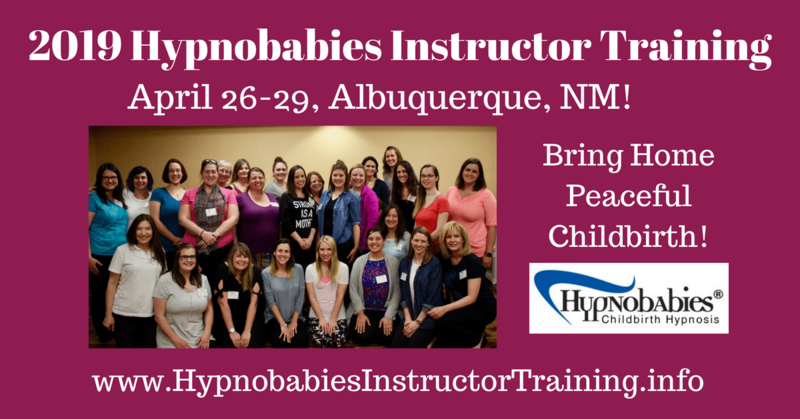 REGISTRATION IS NOW CLOSED for our 4-day 2019 public Hypnobabies Instructor Training in Albuquerque, NM April 25-29, 2019!. Please join us for our next public Instructor Training and bring a much easier way to give birth to the families in your community. Want to ask questions about our 2019 Training? Join our Facebook Hypnobabies Instructor Training Information group! Read the information on this page *and* on our Instructor Training FAQs page. Watch for an e-mail inviting you to call and schedule your Skype Interview. Participate in a short Skype Interview. After acceptance, you will receive an invitation to register for our 2019 Hypnobabies Instructor Training. Instructor Training Registration is completed online, with your deposit due at registration.Read tributes on how our certified Hypnobabies Instructors feel about their training and why they chose to bring Hypnobabies to the families in their communities! Our Hypnobabies Instructor Training is a 4-day course, and each applicant is required to have a background in both childbirth and hypnosis (see below), and a love of working with expectant families! The cost for our training course is $1,395.00 per person, with a deposit of $750 due at registration. * Resource Links for Birthing your Hypnobabies Business (provided free to trainees after registration). * Many other materials. Full list of training and certification materials provided HERE. Course fees are paid online by credit card only, on our Training Registration site. Hypnobabies Instructor Training Registration ends 4 weeks before each training begins. Have Questions? Join our Facebook Hypnobabies Instructor Training Information Group and get them answered immediately! 1) Skype Interview: Each qualified applicant will be contacted by e-mail to schedule a Skype interview with our Program Coordinator. Skype interviews are conducted to see if Hypnobabies is a good fit for *you* before being accepted into our program. You *must* have a Skype account (it’s free) already in place when you call to schedule your Skype Interview; it is free to join. 2) Required Reading and Reviews: There is a Required Reading list of 3 items (see below – Ina May books not included with course fee) which needs to be completed before your Hypnobabies Instructor Training begins, with a one-page review for each item. A) Complete 50 hours of basic hypnosis training from a reputable (and approved-by-Hypnobabies) school of hypnosis – please note that Hypnotherapy *certification* is not required; only 50 hours of hypnosis training. If you choose this training, it must be completed *before* your Skype interview with Hypnobabies takes place. B) All applicants who have not completed 50 hours of basic hypnosis training from a reputable school of hypnosis by the time of their Skype Interview will be required to take our Hypnobabies Self-Study Introduction to Hypnosis Course: $250.00. Considering that most hypnosis courses cost between $700 and $3500, ours is very affordable, contains excellent basic hypnosis information and practice, and fulfills our Hypnobabies hypnosis requirements with much less out of pocket expense while working at your own pace. Your Introduction to Hypnosis Course must be completed before your Hypnobabies Instructor Training begins. 4) Childbirth Education Training: A background in childbirth education means that you are already a birth professional who has completed doula, childbirth, midwifery or nursing training. For those *without* a background in Childbirth Education (our Hypno-moms), our one day Introduction to Childbirth Workshop is *mandatory* and is scheduled on the day before each Hypnobabies Instructor Training. This class costs $175.00 and consists of invaluable information on pregnancy, childbirth, postpartum and educator techniques. Workshop fee includes your resource workbook and all other materials. There is additional reading and review after training; book included in workshop fee. Walk away from our training … trained! “The most through childbirth instructor training available” – that’s what our certified Hypnobabies Instructors find out after they have been trained! Watch Amanda Johnson’s 2 minute video here. 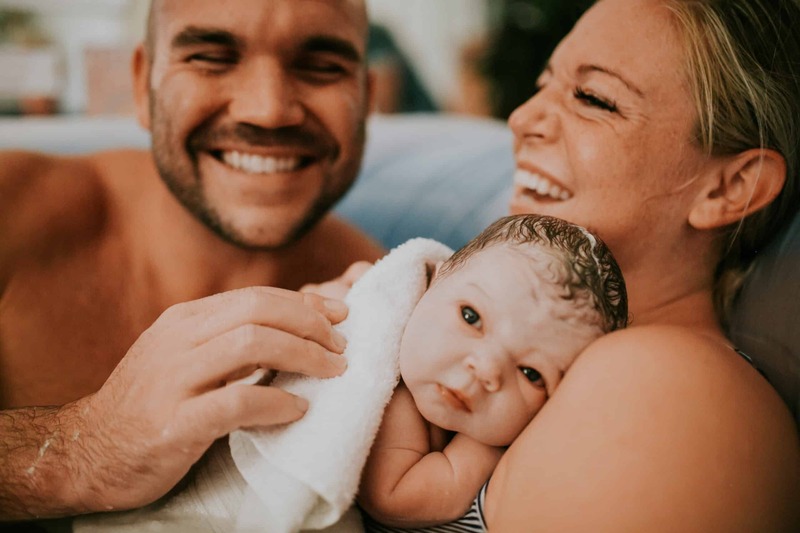 You can also read testimonials from our Hypnobabies Instructors – why they chose to become trained in Hypnobabies, what they thought about the training itself and what it means to them to bring a much easier and more gentle way of birthing to the families in their community. In our Hypnobabies Instructor Training, *you* will become both student and teacher as you easily learn Hypnobabies and how to teach it effectively and compassionately … class by class, participating fully in all facets of your training. With a complete set of teaching materials and our very comprehensive, hands-on instruction, you will feel completely confident at the end of your training that you are qualified to successfully teach Hypnobabies and able to promote and market your classes as well. Our 350 page Instructor’s Manual is so detailed that our course teaches itself, and you will be provided with all Hypnobabies materials that you need to easily begin your journey as a Hypnobabies Instructor. After training, each Hypnobabies Instructor will send in their open-book Final Exam before becoming certified as a Hypnobabies Instructor. If you are a childbirth professional or one of our Hypno-moms that is interested in helping expectant couples have a much easier birth experience, please visit our Instructor Training FAQs page and get started today. I cannot express how awe-inspiring it is to watch a Hypnobabies mom during labor resting quietly and calmly during a contraction, fully 9 cm dilated and looking as though she is having a refreshing nap! She then opens her eyes and smiles, asking for a drink and a change of position, completely relaxed and happy. YES! Our minds are amazingly powerful, controlling our bodies completely and we Hypnobabies Instructors easily and naturally teach women how to use their own minds to the fullest. We are changing the way women give birth, the way babies are born, and the perception of natural childbirth in the world. Join us….. if you are too. Have Questions? Join our Hypnobabies Instructor Training Facebook Group and get them answered immediately! Please feel free to call us at (714) 894-BABY (2229) or e-mail us at Info@Hypnobabies.com for more information.